Congratulations to our Client Kevel for their feature on ABC San Francisco. There is nothing more disappointing than when you slide on your favorite jeans and they’re so tight that the zipper won’t stay up or you’re just plain uncomfortable. A broken zipper, jeans too tight. Kevel is the solution. 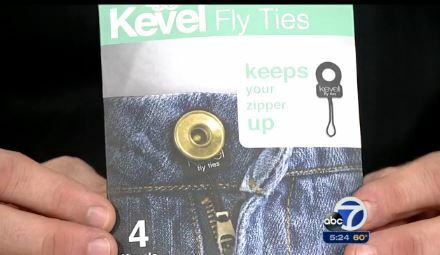 A Kevel Fly Tie is a small, discrete device that secures the zipper of jeans, pants and skirts in the up-and-closed position. The fly tie attaches easily to the handle of your zipper and to the button above it. With the Kevel Perfect Fit you can wear your pants with confidence. The Kevel Perfect Fit has your back by holding up your front. By expanding your waistline and securing your zipper, Kevel Perfect Fit preserves you favorite pants when your body says go a size up. Kevel Mommy is a device that secures your zipper AND expands your waistline for beginning stages of pregnancy and post-pregnancy.Â When your world is turned upside down the first few months of pregnancy, take comfort in knowing you can still slip into your favorite jeans.